Inder Loves Folk Art: Joe's Quilt. Speaking of things that have sat on my sewing table unfinished for a year, this is what I'm planning to work on over this long weekend. It's a quilt for Joe. I'd like to finish it before he turns 20, if possible. That little pouch was embroidered and sewn by my paternal grandmother, Nanny. She was quite the hand-quilter! I thought that I was done hand-quilting this, but on second thought I decided it needed more quilting. I have never met a quilt that I considered to be too densely hand-quilted. On the other hand, I'd like to finish it while Joe is still a child, see above. It's a delicate balance. But. It needed a bit more. I had wondered about this quilt, since you were hand-quilting around the same time I was! It's really a cool-weather-in-front-of-the-telly thing I think. I'm impressed with the density of quilting you've committed to. It does look lovely. I kind of wish Australia did Thanksgiving, it's such a lovely idea, but I don't know if I would have the energy for Christmas afterwards! Have a good one, anyway. I hand quilted a twin size quilt while dating my husband when he was busy with his writing. It is so much work, but the end result is very satisfying. 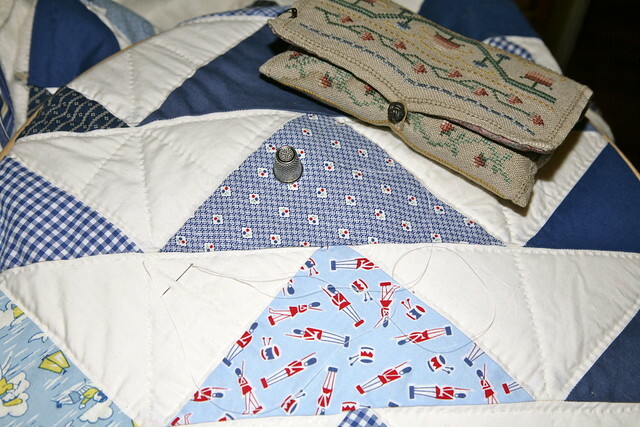 Unfortunately I used some pieces of decades old linen tablecloth in the quilt and they are now all worn away. Now I understand why people don't use linen in quilts! I've gone in and swapped out some of the pieces for cotton, but there is still much to do and the process is pretty painstaking. But after all of that hand quilting it seems worth the effort!